As summer winds down, I feel a need to preserve precious moments from a season that has been far too fleeting. A visit to Annapolis and the restaurant Preserve seems like the appropriate homage. The small restaurant with a window onto Main Street has a focus on “pickling, preserving and fermenting,” a concept that sustains itself year round. 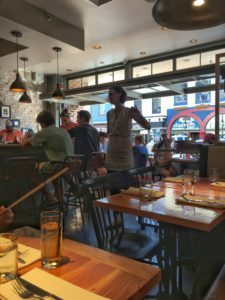 If you follow Washingtonian’s list of Top 100 Restaurants, you are aware of Preserve. In 2016 it ranks an impressive #27. Owners Jeremy and Michelle Hoffman come to Annapolis by way of Per Se and Nobu in New York, as well as Restaurant Eve in Alexandria. Annapolis was lucky to land this duo. Jeremy uses his Pennsylvania Dutch upbringing as a jumping off point to inspire dishes that are fresh and new- often Asian-inspired. A meal here can best be appreciated by ordering at least one dish from each section of the menu, with snacks to start. 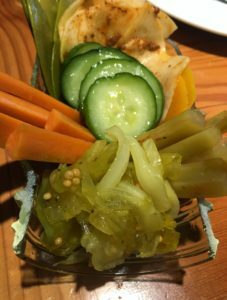 The most important advice I can offer comes down to two words: “quick pickles.” If pickles for $9 sounds steep, once you dig in, you’ll find it entirely justifiable. It’s a plate – actually half a mason jar- filled with golden beets, smoked carrots, curried snow peas, Bloody Mary celery, horseradish cucumber, and more. You may pucker up in reaction to some of the more sour tastes, but in the end your pucker will be an expression of affection. 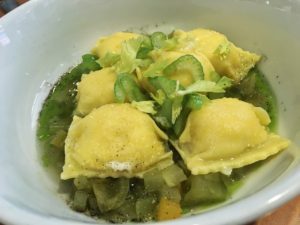 When it comes to starters, I must gush about parmesan stuffed pasta with stewed green tomatoes, celery, and black pepper. A bite into the pasta sets in motion a spurting fountain of buttery, cheesy liquid. Keep your napkin nearby. Children at the table next to us are gleefully devouring chicken pot pie with egg noodles and saffron. I control my urge to ask for a taste, but make a note to order this on a future visit. The “veg out” section of Preserve’s menu is a terrific place to linger. There are bread and butter green tomatoes with grilled bread and goat cheese, hand cut fries with smoked mayonnaise, and crispy kale with cumin yogurt, pepper jelly and red onions. A heavenly meal can be made from these dishes alone. Main courses can best be described as comfort food with twists. Here is where the pickling, preserving, and fermenting does its best work, serving to lighten up and add interest to hearty dishes. 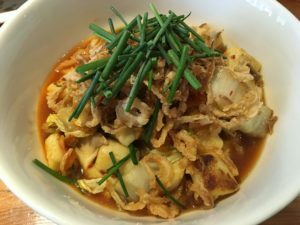 Gnocchi is tossed with oyster mushrooms, kimchi, and crispy onions. It’s a head-scratcher at first, but the combination works. I find it well-suited for sharing, as the powerful flavors can be overwhelming. 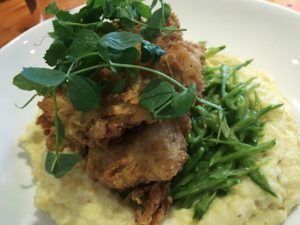 Chicken fried blue catfish is plated with a hefty portion of creamy goat cheese corn meal. Snow peas and basil vinaigrette brighten it up. 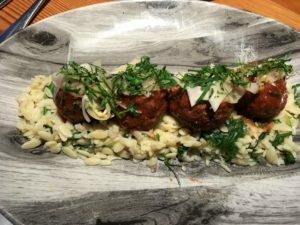 Roseda beef meatballs are a delight with orzo and arugula. Pickled fennel adds the wow factor. Preserve doesn’t take reservations. We arrive early on a Saturday evening and benefit from happy hour drink and snack specials at the bar, which gives us first dibs on a table. It’s a good move, as the wait is close to an hour for later arrivals. If you have to wait however, Annapolis is chock full of sights to occupy your time. I feel a sense of satisfaction when I check Preserve off my summer bucket list. It’s comforting to know that when cooler weather prevails, I can return here to enjoy some of the bounty we’re about to leave behind.